CLEVELAND — Not only was their champagne on ice, but their wedding ceremony was too! 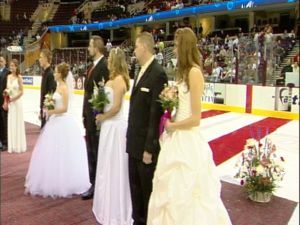 Twelve couples who won a promotional contest sponsored by a local radio station tied the knot at the Lake Erie Monsters Hockey Game at Q Arena Thursday night. The ceremonies were performed during the intermissions squeezed in between hockey play and the zamboni cleaning the ice. They were short, but sweet. And they were all legal. Reverend Mark Bernard of Austintown said the couples had to say “I do” and he had to hear each person say the words in order to comply with Ohio law. He also had to sign the wedding certificates. Though some say getting married during the game is unusual, it is legal and was celebrated by all who witnessed the blessed event.